Reading - Pavel Pogrebnyak boosted Reading's bid for English Premier League survival as the Russian forward clinched a 1-0 win over West Ham on Saturday. 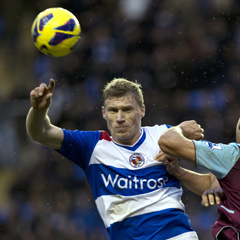 Pogrebnyak struck early in the first half to give Brian McDermott's side just their second league victory of the season. The second bottom Royals had halted a run of seven defeats with a draw at home to Swansea on Boxing Day and continued their momentum with a win that moved them within five points of safety. It was a horrible mistake from James Collins that presented Pogrebnyak with a late Christmas gift after only five minutes at the Madejski Stadium. Hammers defender Collins looked to play a simple ball back to goalkeeper Jussi Jaaskelainen, but made a hash of his pass and Pogrebnyak stole in to slot past the Finn. Reading found it hard to maintain their momentum after that and Sam Allardyce's team almost equalised on the stroke of half-time. Kevin Nolan pounced and found Gary O'Neil, but he appeared to be caught in two minds and his final ball was neither a shot or a cross. Pogrebnyak had the ball in the back of the net again five minutes after the restart but was flagged offside after latching onto a through ball from Mikele Leigertwood. Jack Collison almost drew the visitors level but his low shot was parried by Adam Federici with no West Ham player able to tap home the rebound. Although the Hammers were starting to finally find their feet in the game they almost fell further behind when Jem Karacan's thunderous effort was tipped onto the bar by Jaaskelainen. Ricardo Vaz Te was involved again moments later as he missed West Ham's best opening of the game, heading Matt Jarvis's cross wide of the goal from close-range.